Muolhoi | August 9, 2018: Zani August 8, 2018 zing dar 9:00 khan Hmar Students’ Association Joint Headquarters Assam Hills chun, Nazareth Model High School, Muolhoi an kan.
Hi hunah hin Nazareth Model High School, Muolhoi chu Dima Hasao (N.C Hills) district sunga SEBA hnuoia High School Leaving Certificate Examination 2018 ah za-a za hlawtlingna an chang lawmpuina Memento an inhlan. Thilpek hi principal Lalronghak Joute in a lo dawng. 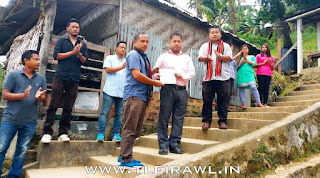 Hi huna thu hriltu HSA Joint Headquarters Assam Hills President Pu John Mark Pena chun, “ kum tin result țha tak an hmu pei thei dingin nasa tak a inchuk ding le an senior a lo pass ta hai nek a result țha lem hmu tum a, thang la thar ding le inchuklai tam tak HSLC a thaw țha, amiruokchu HSSLC le Degree level chen a thla hnuoi peiin, a tawp a lem chu hmu ding um ta lo an um chu pawi a ti thu” a hril. HSA Assam Hills JHQ Career Counsellor Rev. Samuel Lalringum Țhiek in tawngtainain hun a suktawp. Hi hunah hin an president John Mark Pena a rawiin vice president Liensanglor Zate, General Secretary Tv. James Selate, Finance Secretary Tv. Joseph R. Ralsun, Secy. Statistic Tv. Lalramdin Tuolor, Secy. Public Relation Tv.Hmingchunghnung Khawzawl le Career Counsellor Rev. Samuel Lalringum Țhiek hai an fe. Nazareth Model High School, Muolhoi kum 1985 indin a ni a, Independent Church of India kohranin an enkawl a ni a. Tuhin Staff hin an rengin mi 18 an ni mek.